Most popular apps preferred by lots of smartphone users often in app stores draw attention with their easy and fun usage apart from their features. The Mobile app design trends make it possible. 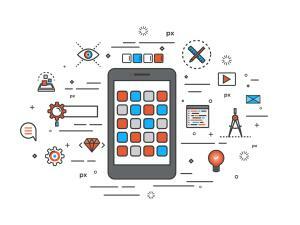 The design process of a mobile app also largely determine how an app can be successful when it reaches to users. Therefore, when it comes to the design of the mobile app, it is also possible to develop the success of the app. If you are planning to do different and successful businesses in mobile app area, you can make your mobile app reach more users by following mobile app designs and trends. Especially mobile app design trends will extremely help you. So, what are the most popular mobile app designs? What can you gather for your app with these trends? Here are the mobile app design trends that will help your mobile app to be appreciated for its value. Graphic designs are sometimes used in mobile apps. At least, it used to be for some mobile apps in the past. However, professional photos took the place of graphic drawings among the mobile app design trends. Real people in professional photos makes the user believe in the app and find the app as qualified and professional as the photos. At this point, you can use stock photos, and you can improve the user satisfaction with suitable photos for your mobile app. Related post: How Do You Hire a Mobile App Developer? Maybe you noticed that all the icons have started “rounded” in mobile apps and even in new screen layouts. This rounded layouts shaped as bubbles made icons suitable for the fingers and therefore touching. This mobile app design trend introduced by Google won recognition with its minimalist looking. Thus, if you will start to design a mobile app, you can catch the trend by creating “rounded” command symbols in your mobile app. Navigation has a critical place among the essential features of mobile apps. Therefore, mobile app needs to move with the user and catch the place as much as it catches the time. So, how will you design your navigation? While choosing the navigation design that will significantly guide your users, firstly, you better consider it to be simple and easy. The complex array of the symbols, tabs covering the content and patterns as complex as them, may cause your user to have hard times which causes him not being able to use the app navigation system efficiently. In this case, transparent sliding backgrounds and rounded icons may help you. Choosing a font suitable for the style of the mobile app may not be easy. Digital fonts such as Arial, Times New Roman which we come across in lots of areas are long gone. You need more modern and attractive alternatives for your mobile app. You have more high-quality choices than before. However, using more than one of these choices may complicate your mobile app’s layout/design. Thus, by imagining the least choice and simplest design you can choose your font. Colors are another important feature in a mobile app, of course. Using soft and simple colors which don’t strain eyes is crucial. As you can understand from here, one of the mobile app design trends is focusing on the pastel-shaded colors in the color scale. You can find a perfect color for your app among these pastel shades and make your users use your mobile app with ease and fun. With mobile app design trends, you can make your mobile app popular among the users. For all these trends and features which will make your mobile app more useful and fun, meet with MobiRoller. By increasing the benefit that you want to serve your users via MobiRoller, you can win their trust and satisfaction. Create your mobile app as soon as possible.